Check out our MTG Message Boards where you can trade MTG Card, discuss decks & discuss strategies with other Pojo Fans! Tuesday, September 26, 2017 Today's Card of the Day is Waker of the Wilds from Ixalan. David & James have reviews for you today. Monday, September 25, 2017 Today's Card of the Day is Revel in Riches from Ixalan. David & James have reviews for you today. Friday, September 22, 2017 Today's Card of the Day is Huatli, Warrior Poet from Ixalan. David & James have reviews for you today. Thursday, September 21, 2017 It's Throwback Thursday! Today's Card of the Day is Mana Drain from Legends. David & James have reviews for you today. Wednesday, September 20, 2017 Today's Card of the Day is Shaper's Sanctuary from the new Ixalan expansion. David & James have reviews for you today. Tuesday, September 19, 2017 Today's Card of the Day is Siren Stormtamer from the new Ixalan expansion. David & James have reviews for you today. Monday, September 18, 2017 Today's Card of the Day is Growing Rites of Itlimoc / Itlimoc, Cradle of the Sun from the new Ixalan expansion. David & James have reviews for you today. Friday, September 15, 2017 Today's Card of the Day is Drake Haven. David & James have reviews for you today. Thursday, September 14, 2017 Today's Card of the Day is Metallic Mimic. David & James have reviews for you today. Wednesday, September 13, 2017 Today's Card of the Day is Refurbish from Kaladesh. David & James have reviews for you today. 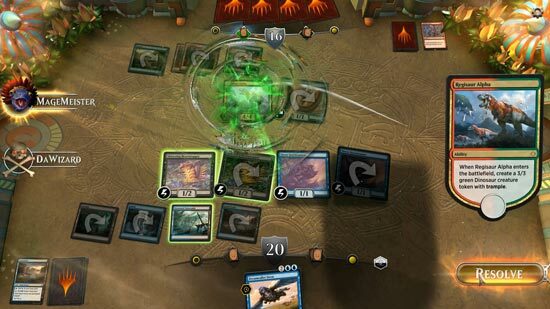 Wizards of the Coast revealed their upcoming and all-new "free-to-play" digital card game based off the revered Magic: The Gathering trading card game - Magic: The Gathering Arena. The game is the first game to be developed by Wizards of the Coast's new Digital Games Studio and will be creating a Magic digital experience with the full rules and ongoing content support for new card sets - just like the original card game. Wizards is also encouraging fans to sign up for the upcoming Closed Beta at PlayMTGArena.com as well. More details in Today's MTG News. Tuesday, September 12, 2017 Today's Card of the Day is Angel of Sanctions from Kaladesh. David & James have reviews for you today. Monday, September 11, 2017 Today's Card of the Day is Veteran Motorist from Kaladesh . David & James have reviews for you today. Friday, September 8, 2017 Today's Card of the Day is Gishath, Sun's Avatar from Ixalan. David has a review for you today. Thursday, September 7, 2017 Today's Card of the Day is Allosaurus Rider from Ixalan. David has a review for you today. Wednesday, September 6, 2017 Today's Card of the Day is Sunbird's Invocation from Ixalan. David has a review for you today. Tuesday, September 5, 2017 Today's Card of the Day is Kinjalli's Sunwing from Ixalan. David has a review for you today. Friday, September 1, 2017 Today's Card of the Day is Ramos, Dragon Engine from the new Commander 2017 decks. David & James have reviews for you today. Thursday, August 31, 2017 Today's Card of the Day is Teferi's Protection from the new Commander 2017 decks. David & James have reviews for you today. Wednesday, August 30, 2017 Today's Card of the Day is Alms Collector from the new Commander 2017 decks. David & James have reviews for you today. Tuesday, August 29, 2017 Today's Card of the Day is Boneyard Scourge from the new Commander 2017 decks. David & James have reviews for you today. Monday, August 28, 2017 Today's Card of the Day is Hungry Lynx from the new Commander 2017 decks. David & James have reviews for you today. Friday, August 25, 2017 Today's Card of the Day is Inalla, Archmage Ritualist from the new Commander 2017 decks. David & James have reviews for you today. Thursday, August 24, 2017 Today's Card of the Day is The Ur-Dragon from the new Commander 2017 decks. David & James have reviews for you today. Wednesday, August 23, 2017 Today's Card of the Day is Edgar Markov from the new Commander 2017 decks. David & James have reviews for you today. Tuesday, August 22, 2017 Today's Card of the Day is Abrade from the new Commander 2017 decks. David & James have reviews for you today. Friday, August 18, 2017 On Monday, August 21, 2017, a total solar eclipse will be visible within a band across the entire United States. To get folks in the mood, we decided to have a week of eclipsey-type cards (in name or cool artwork). Today's Card of the Day is All Sun's Dawn. David & James have reviews for you today. Thursday, August 17, 2017 It's Throwback Thursday! Today's MTG Card of the Day is Kyoki, Sanity's Eclipse from Betrayers of Kamigawa. James and David have reviews for you today. Wednesday, August 16, 2017 On Monday, August 21, 2017, a total solar eclipse will be visible within a band across the entire United States. To get folks in the mood, we decided to have a week of eclipsey-type cards (in name or cool artwork). Today's Card of the Day is Damnation. David & James have reviews for you today. Tuesday, August 15, 2017 On Monday, August 21, 2017, a total solar eclipse will be visible within a band across the entire United States. To get folks in the mood, we decided to have a week of eclipsey-type cards (in name or cool artwork). Today's Card of the Day is Darkest Hour. David & James have reviews for you today. Monday, August 14, 2017 On Monday, August 21, 2017, a total solar eclipse will be visible within a band across the entire United States. To get folks in the mood, we decided to have a week of eclipsey-type cards (in name or cool artwork). Today's Card of the Day is Vampire Nighthawk. David & James have reviews for you today. Friday, August 11, 2017 Today's Card of the Day is Bontu's Last Reckoning from the new Hour of Devastation expansion. David & James have reviews for you today. Thursday, August 10, 2017 It's Throwback Thursday! Today's MTG Card of the Day is Threads of Disloyalty from Betrayers of Kamigawa. James and David have reviews for you today. Wednesday, August 9, 2017 Today's Card of the Day is Hollow One from the new Hour of Devastation expansion. David & James have reviews for you today. Tuesday, August 8, 2017 Today's Card of the Day is Claim // Fame from the new Hour of Devastation expansion. David & James have reviews for you today. Monday, August 7, 2017 Today's Card of the Day is Abrade from the new Hour of Devastation expansion. David & James have reviews for you today. Friday, August 4, 2017 Today's Card of the Day is Razaketh, the Foulblooded from the new Hour of Devastation expansion. David & James have reviews for you today. Thursday, August 3, 2017 It's Throwback Thursday! Today's MTG Card of the Day is Traveler's Amulet from Innistrad. James and David have reviews for you today. Wednesday, August 2, 2017 Today's Card of the Day is Hour of Devastation from the new Hour of Devastation expansion. David & James have reviews for you today. Tuesday, August 1, 2017 Today's Card of the Day is Uncage the Menagerie from the new Hour of Devastation expansion. David & James have reviews for you today. Monday, July 31, 2017 Today's Card of the Day is Ramunap Excavator from the new Hour of Devastation expansion. David & James have reviews for you today. Friday, July 28, 2017 Today's Card of the Day is Nicol Bolas, God-Pharaoh from the new Hour of Devastation expansion. David & James have reviews for you today. Thursday, July 27, 2017 It's Throwback Thursday! Today's MTG Card of the Day is Doomsday from Weatherlight (1997) ... wow this card is already 20 years now! James and David have reviews for you today. Wednesday, July 26, 2017 Today's Card of the Day is The Scarab God from the new Hour of Devastation expansion. David & James have reviews for you today. Tuesday, July 25, 2017 Today's Card of the Day is The Locust God from the new Hour of Devastation expansion. David & James have reviews for you today. Monday, July 24, 2017 Today's Card of the Day is The Scorpion God from the new Hour of Devastation expansion. David & James have reviews for you today. Friday, July 21, 2017 Today's Card of the Day is Pride Sovereign from the new Hour of Devastation expansion. David & James have reviews for you today. Thursday, July 20, 2017 It's Throwback Thursday! Today's MTG Card of the Day is Lord of Extinction from Alara Reborn (2009). James and David have reviews for you today. Wednesday, July 19, 2017 Today's Card of the Day is Torment of Scarabs from the new Hour of Devastation expansion. David & James have reviews for you today. Tuesday, July 18, 2017 We missed getting up yesterday's MTG COTD, so you get a Twofer-Tuesday today. Today's Cards of the Day are Crested Sunmare & Strategic Planning from the new Hour of Devastation expansion. David & James have reviews for you today. Friday, July 14, 2017 Today's MTG Card of the Day is Nissa Worldwaker from the new "Archenemy: Nicol Bolas Game Pack". David & James have reviews for you today. Thursday, July 13, 2017 It's Throwback Thursday! Today's MTG Card of the Day is Obsidian Fireheart from Zendikar (2009). James and David have reviews for you today. Wednesday, July 12, 2017 Today's MTG Card of the Day is Inferno Titan from the new "Archenemy: Nicol Bolas Game Pack". David & James have reviews for you today. Tuesday, July 11, 2017 Today's MTG Card of the Day is Gideon Jura from the new "Archenemy: Nicol Bolas Game Pack". David & James have reviews for you today. Monday, July 10, 2017 Today's MTG Card of the Day is Chandra, Pyromancer from the new "Archenemy: Nicol Bolas Game Pack". David & James have reviews for you today. Friday, July 7, 2017 Today's MTG Card of the Day is Rewind. David has a review for you today. Thursday, July 6, 2017 It's Throwback Thursday! Today's MTG Card of the Day is Avatar of Hope from Prophecy (2000). James has a review for you today. Wednesday, July 5, 2017 Today's MTG Card of the Day is Pyromancer Ascension. David has a review for you today. The folks at Viz Media have just released another MTG hardcover: "The Art of Magic: The Gathering - Amonkhet". "The Second Sun creeps across the sky, growing ever closer to the horns of the God-Pharaoh. These pages, lavishly illustrated with the award-winning art of Magic: The Gathering®, will introduce you to the people of Amonkhet, whose life is a series of trials meant to prepare them for the great God-Pharaoh’s return. Join the heroic Planeswalkers of the Gatewatch as they come here to face the evil dragon Nicol Bolas, whose schemes span the planes of the Multiverse." - 240 pages! Friday, June 30, 2017 Today's MTG Card of the Day is Liliana of the Veil. David & James have reviews for you today. Thursday, June 29, 2017 It's Throwback Thursday! Today's MTG Card of the Day is Demonic Consultation from Ice Age (1995). David & James have reviews for you today. Wednesday, June 28, 2017 Today's MTG Card of the Day is Lingering Souls. David & James have reviews for you today. Tuesday, June 27, 2017 Today's MTG Card of the Day is Rest in Peace. David & James have reviews for you today. Monday, June 26, 2017 Today's MTG Card of the Day is Death’s Shadow. David & James have reviews for you today. Friday, June 23, 2017 Today's MTG Card of the Day is Karlov of the Ghost Council. David & James have reviews for you today. Thursday, June 22, 2017 It's Throwback Thursday, inside Commander Week! Today's MTG Card of the Day is Captain Sisay from Invasion(2000). David & James have reviews for you today. Wednesday, June 21, 2017 It's Commander Week. James pointed out that today's card was recently banned in Commander. My Bad! Let's find out why?! Today's MTG Card of the Day is Leovold, Emissary of Trest. David & James have reviews for you today. Tuesday, June 20, 2017 It's Commander Week. This week we're looking at some Commander Cards we've never reviewed. Today's MTG Card of the Day is Kraum, Ludevic's Opus. David & James have reviews for you today. Monday, June 19, 2017 It's Commander Week. This week we're looking at some Commander Cards we've never reviewed. Today's MTG Card of the Day is Vial Smasher the Fierce. David & James have reviews for you today. Friday, June 16, 2017 Today's MTG Card of the Day is Bontu the Glorified from Amonkhet. David & James have reviews for you today. Thursday, June 15, 2017 It's Throwback Thursday! Today's MTG Card of the Day is Soul Spike from Coldsnap (2006). David & James have reviews for you today. Wednesday, June 14, 2017 Today's MTG Card of the Day is Kefnet the Mindful from Amonkhet. David & James have reviews for you today. Tuesday, June 13, 2017 Today's MTG Card of the Day is Rhonas the Indomitable from Amonkhet. David & James have reviews for you today. Monday, June 12, 2017 Today's MTG Card of the Day is Hazoret the Fervent from Amonkhet. David & James have reviews for you today. Friday, June 9, 2017 Today's MTG Card of the Day is Faith of the Devoted from Amonkhet. David & James have reviews for you today. Thursday, June 8, 2017 It's Throwback Thursday! Today's MTG Card of the Day is Battle of Wits from Odyssey (2001). David & James have reviews for you today. Wednesday, June 7, 2017 Today's MTG Card of the Day is Expropriate from Kaladesh. David & James have reviews for you today. Tuesday, June 6, 2017 Today's MTG Card of the Day is Expropriate from Conspiracy: Take the Crown. David & James have reviews for you today. Monday, June 5, 2017 Today's MTG Card of the Day is Approach of the Second Sun from Amonkhet. David & James have reviews for you today. Friday, June 2, 2017 Today's MTG Card of the Day is Liliana, Death's Majesty from Amonkhet. David has a review for you today. Thursday, June 1, 2017 It's Throwback Thursday! Today's MTG Card of the Day is Magma Spray from Shards of Alara (2008). David has a review for you today. Wednesday, May 31, 2017 Today's MTG Card of the Day is Censor from Amonkhet. David has a review for you today. Tuesday, May 30, 2017 Today's MTG Card of the Day is Cast Out from Amonkhet. David has a review for you today. Friday, May 26, 2017 Today's MTG Card of the Day is Dark Ritual from Alpha . David and James have reviews for you today. Thursday, May 25, 2017 It's Throwback Thursday! Today's MTG Card of the Day is Mind Twist from Alpha (1993). David and James have reviews for you today. Wednesday, May 24, 2017 Today's MTG Card of the Day is Shadow of the Grave from the the new Amonkhet expansion. David and James have reviews for you today. Tuesday, May 23, 2017 Today's MTG Card of the Day is Vindicate from Mirrodin Besieged . David and James have reviews for you today. Monday, May 22, 2017 Today's MTG Card of the Day is Aven Mindcensor from the new Amonkhet expansion - which is actually our 3900th COTD! James has a review for you today. Friday, May 19, 2017 Today's MTG Card of the Day is Prowling Serpopard from the new Amonkhet expansion. David and James have reviews for you today. Thursday, May 18, 2017 It's Throwback Thursday! Today's MTG Card of the Day is Gamble from the Urza's Saga expansion (1998). David and James have reviews for you today. Wednesday, May 17, 2017 Today's MTG Card of the Day is Shadow of the Grave from the the new Amonkhet expansion. David and James have reviews for you today. Tuesday, May 16, 2017 Today's MTG Card of the Day is Manglehorn from the the new Amonkhet expansion. David and James have reviews for you today. Monday, May 15, 2017 Today's MTG Card of the Day is Harsh Mentor from the the new Amonkhet expansion. David and James have reviews for you today. Friday, May 12, 2017 Today's MTG Card of the Day is Archfiend of Ifnir from the the new Amonkhet expansion. David and James have reviews for you today. Thursday, May 11, 2017 It's Throwback Thursday! Today's MTG Card of the Day is Divert from the Odyssey expansion (2001). David and James have reviews for you today. Wednesday, May 10, 2017 Today's MTG Card of the Day is As Foretold Tomorrow from the new Amonkhet expansion. David and James have reviews for you today. Tuesday, May 9, 2017 Today's MTG Card of the Day is Pull from Tomorrow from the new Amonkhet expansion. David and James have reviews for you today. Monday, May 8, 2017 Today's MTG Card of the Day is Glorybringer from the new Amonkhet expansion. David and James have reviews for you today. Friday, May 5, 2017 Today's MTG Card of the Day is Sandwurm Convergence from the new Amonkhet expansion. David and James have reviews for you today. Thursday, May 4, 2017 It's Throwback Thursday! Today's MTG Card of the Day is Ali from Cairo from Arabian Nights (1993). David and James have reviews for you today. Wednesday, May 3, 2017 Today's MTG Card of the Day is Oketra the True from the new Amonkhet expansion. David and James have reviews for you today. Tuesday, May 2, 2017 Today's MTG Card of the Day is Glorious End from the new Amonkhet expansion. David and James have reviews for you today. Monday, May 1, 2017 Today's MTG Card of the Day is Plague Belcher from the new Amonkhet expansion. David and James have reviews for you today. Friday, April 28, 2017 Today's MTG Card of the Day is Gideon of the Trials from the new Amonkhet expansion. David and James have reviews for you today. Thursday, April 27, 2017 It's Throwback Thursday! Today's MTG Card of the Day is Shatterstorm from Antiquities (1994). David and James have reviews for you today. Wednesday, April 26, 2017 Today's MTG Card of the Day is Vizier of the Menagerie from the new Amonkhet expansion. David and James have reviews for you today. We also added reviews from James towards yesterdays cards. A new Banned and Restricted List was posted by Wizards of the Coast yesterday. No changes were made to Standard or Modern. Vintage: Gitaxian Probe is restricted. Gush is restricted. Tuesday, April 25, 2017 We had to take yesterday off, so you get a Twofer Tuesday today! Today's MTG Cards of the Day are Samut, Voice of Dissent & Nissa, Steward of Elements from Amonkhet. David has reviews for you today. Friday, April 21, 2017 Today's MTG Card of the Day is Snap from the new Duel Decks: Mind vs. Might. David and James have reviews for you today. Thursday, April 20, 2017 It's Throwback Thursday! Today's MTG Card of the Day is Mind's Desire from Duel Decks: Mind vs. Might (originally from Scourge - 2003). David and James have reviews for you today. Wednesday, April 19, 2017 Today's MTG Card of the Day is Shivan Meteor from the new Duel Decks: Mind vs. Might. David and James have reviews for you today. Tuesday, April 18, 2017 Today's MTG Card of the Day is Grapeshot from the new Duel Decks: Mind vs. Might. David and James have reviews for you today. Monday, April 17, 2017 Today's MTG Card of the Day is Nivix Cyclops from the new Duel Decks: Mind vs. Might. David and James have reviews for you today. Thursday, April 13, 2017 It's Throwback Thursday! Today's MTG Card of the Day is Night of Souls' Betrayal from Champions of Kamigawa. David and James have reviews for you today. Wednesday, April 12, 2017 Today's MTG Card of the Day is Cavern of Souls from Modern Masters 2017. David and James have reviews for you today. Tuesday, April 11, 2017 Today's MTG Card of the Day is Falkenrath Aristocrat from Modern Masters 2017. David and James have reviews for you today. Monday, April 10, 2017 Today's MTG Card of the Day is Craterhoof Behemoth from Modern Masters 2017. David and James have reviews for you today. Friday, April 7, 2017 Today's MTG Card of the Day is Soul Ransom from Modern Masters 2017. David and James have reviews for you today. Thursday, April 6, 2017 It's Throwback Thursday! Today's MTG Card of the Day is Hymn of Rebirth from Ice Age. David and James have reviews for you today. Wednesday, April 5, 2017 Today's MTG Card of the Day is Aethermage's Touch from Modern Masters. David and James have reviews for you today. Tuesday, April 4, 2017 Today's MTG Card of the Day is Agent of Masks from Modern Masters. David and James have reviews for you today. Monday, April 3, 2017 Today's MTG Card of the Day is Coiling Oracle from Modern Masters. David and James have reviews for you today. Friday, March 31, 2017 Today's MTG Card of the Day is Venser, Shaper Savant from Modern Masters 2017. David and James have reviews for you today. Thursday, March 30, 2017 It's Throwback Thursday! Today's MTG Card of the Day is Bazaar of Baghdad from Arabian Nights. David and James have reviews for you today. Wednesday, March 29, 2017 Today's MTG Card of the Day is Ranger of Eos from Modern Masters 2017. David and James have reviews for you today. Tuesday, March 28, 2017 Today's MTG Card of the Day is Goblin Guide from Modern Masters 2017. David and James have reviews for you today. Monday, March 27, 2017 Today's MTG Card of the Day is Avacyn's Pilgrim from Modern Masters 2017. James has a review for you today. Tuesday, March 21, 2017 Today's MTG Card of the Day is Past in Flames from Modern Masters 2017. James and Dave have review for you today. Monday, March 20, 2017 Today's MTG Card of the Day is Linvala, Keeper of Silence from Modern Masters 2017. James and Dave have review for you today. Friday, March 17, 2017 Today's MTG Card of the Day is Tarmogoyf from Modern Masters 2017. David has a review for you today. Thursday, March 16, 2017 It's Throwback Thursday! Today's MTG Card of the Day is Blood Moon from The Dark. David has a review for you today. Wednesday, March 15, 2017 Today's MTG Card of the Day is Terminus from Modern Masters 2017. David has a review for you today. Tuesday, March 14, 2017 Today's MTG Card of the Day is Zur the Enchanter from Modern Masters 2017. David has a review for you today. Monday, March 13, 2017 Today's MTG Card of the Day is Damnation from Modern Masters 2017. David has a review for you today. Friday, March 10, 2017 Today's MTG Card of the Day is Indomitable Creativity. James and David have reviews for you today. Thursday, March 9, 2017 It's Throwback Thursday. Today's MTG Card of the Day is Atog which goes back to Antiquities. James and David have reviews for you today. Wednesday, March 8, 2017 Today's MTG Card of the Day is Hope of Ghirapur from Aether Revolt. James and David have reviews for you today. Tuesday, March 7, 2017 Today's MTG Card of the Day is Call for Unity from Aether Revolt. James and David have reviews for you today. Monday, March 6, 2017 Today's MTG Card of the Day is Trophy Mage from Aether Revolt. James and David have reviews for you today. Friday, March 3, 2017 Today's MTG Card of the Day is Domri Rade. James and David have reviews for you today. Thursday, March 2, 2017 It's Throwback Thursday. Today's MTG Card of the Day is Nicol Bolas, Planeswalker which goes back to Conflux. James and David have reviews for you today. Wednesday, March 1, 2017 Today's MTG Card of the Day is Sorin, Grim Nemesis. James and David have reviews for you today. Tuesday, February 28, 2017 Today's MTG Card of the Day is Ajani Unyielding. James and David have reviews for you today. Monday, February 27, 2017 Today's MTG Card of the Day is Jace, Unraveler of Secrets. James and David have reviews for you today. Friday, February 24, 2017 Today's MTG Card of the Day is Walking Ballista from Aether Revolt. James and David have reviews for you today. Thursday, February 23, 2017 We're starting something new site-wide today - Throwback Thursday. Today's MTG Card of the Day is Ornithopter which goes back to Antiquities. James and David have reviews for you today. Wednesday, February 22, 2017 Today's MTG Card of the Day is Tezzeret's Touch from Aether Revolt. James and David have reviews for you today. Tuesday, February 21, 2017 Today's MTG Card of the Day is Baral, Chief of Compliance from Aether Revolt. James and David have reviews for you today. Monday, February 20, 2017 Today's MTG Card of the Day is Mechanized Production from Aether Revolt. James and David have reviews for you today. Friday, February 17, 2017 We looking at more cards from the new Aether Revolt expansion. Today's MTG Card of the Day is Inspiring Statuary. James and David have reviews for you today. Thursday, February 16, 2017 We looking at more cards from the new Aether Revolt expansion. Today's MTG Card of the Day is Heroic Intervention. James and David have reviews for you today. Wednesday, February 15, 2017 We looking at more cards from the new Aether Revolt expansion. Today's MTG Card of the Day is Paradox Engine. James and David have reviews for you today. Tuesday, February 14, 2017 Happy Valentine's Day! Today's MTG Card of the Day is Gonti's Aether Heart. James and David have reviews for you today. Friday, February 10, 2017 Today's MTG Card of the Day is Melira, Sylvok Outcast. James and David have reviews for you today. Thursday, February 9, 2017 Today's MTG Card of the Day is Inkmoth Nexus. James and David have reviews for you today. Wednesday, February 8, 2017 Today's MTG Card of the Day is Karn Liberated. James and David have reviews for you today. Tuesday, February 7, 2017 Today's MTG Card of the Day is Doubling Season. James and David have reviews for you today. Monday, February 6, 2017 Today's MTG Card of the Day is Horobi, Death's Wail from Champions of Kamigawa. James and David have reviews for you today. Friday, February 3, 2017 Today's MTG Card of the Day is Monstrous Onslaught from Aether Revolt. James and David have reviews for you today. Thursday, February 2, 2017 Today's MTG Card of the Day is Sly Requisitioner from Aether Revolt. James and David have reviews for you today. Wednesday, February 1, 2017 Today's MTG Card of the Day is Cogwork Assembler from Aether Revolt. James and David have reviews for you today. Tuesday, January 31, 2017 Today's MTG Card of the Day is Battle at the Bridge from Aether Revolt. James and David have reviews for you today. Monday, January 30, 2017 Today's MTG Card of the Day is Exquisite Archangel from Aether Revolt. James and David have reviews for you today. Friday, January 27, 2017 Today's MTG Card of the Day is Fatal Push from Aether Revolt. James and David have reviews for you today. Thursday, January 26, 2017 Today's MTG Card of the Day is Heart of Kiran from Aether Revolt. James and David have reviews for you today. Wednesday, January 25, 2017 We're starting our look at the new Aether Revolt expansion. Today's MTG Card of the Day is Yahenni's Expertise. James and David have reviews for you today. Tuesday, January 24, 2017 We're starting our look at the new Aether Revolt expansion. Today's MTG Card of the Day is Felidar Guardian. David has a review for you today. Monday, January 23, 2017 We're starting our look at the new Aether Revolt expansion. Today's MTG Card of the Day is Disallow. David has a reviews for you today. Friday, January 20, 2017 We're starting our look at the new Aether Revolt expansion. Today's MTG Card of the Day is Rishkar, Peema Renegade. James and David have reviews for you today. Thursday, January 19, 2017 We're starting our look at the new Aether Revolt expansion. Today's MTG Card of the Day is Oath of Ajani. James and David have reviews for you today. Wednesday, January 18, 2017 We're starting our look at the new Aether Revolt expansion. Today's MTG Card of the Day is Sram's Expertise. James and David have reviews for you today. Tuesday, January 17, 2017 We're starting our look at the new Aether Revolt expansion. Today's MTG Card of the Day is Shock. James and David have reviews for you today. Monday, January 16, 2017 We're starting our look at the new Aether Revolt expansion. Today's MTG Card of the Day is Spire of Industry. James has a review for you today. Friday, January 13, 2017 We're starting our look at the new Aether Revolt expansion. Today's MTG Card of the Day is Narnam Renegade. David and James have reviews for you today. Thursday, January 12, 2017 We're starting our look at the new Aether Revolt expansion. Today's MTG Card of the Day is Unbridled Growth. David and James have reviews for you today. Wednesday, January 11, 2017 We're starting our look at the new Aether Revolt expansion. Today's MTG Card of the Day is Lifecraft Awakening. David and James have reviews for you today. Tuesday, January 10, 2017 We're starting our look at the new Aether Revolt expansion. Today's MTG Card of the Day is Maulfist Revolutionary. David and James have reviews for you today. Monday, January 9, 2017 We're starting our look at the new Aether Revolt expansion. Today's MTG Card of the Day is Highspire Infusion. David and James have reviews for you today. Friday, January 6, 2017 Happy New Year! We're looking at cards this week that just missed our Top 10! Today's MTG Card of the Day is Fleetwheel Cruiser. David & James have reviews for you today. Thursday, January 5, 2017 Happy New Year! We're looking at cards this week that just missed our Top 10! Today's MTG Card of the Day is General Tazri. David & James have reviews for you today. Wednesday, January 4, 2017 Happy New Year! We're looking at cards this week that just missed our Top 10! Today's MTG Card of the Day is Gisa and Geralf. David & James have reviews for you today. Tuesday, January 3, 2017 Happy New Year! We're looking at cards this week that just missed our Top 10! Today's MTG Card of the Day is Grim Flayer. David & James have reviews for you today.